When California voters passed Proposition 64 in November 2016, it became legal for people over age 21 to possess up to 28.5 grams of cannabis for recreational use. This change opened up a number of new issues for law enforcement, particularly when it comes to search and seizure. Can evidence of marijuana still be probable cause for a warrantless search of a person or vehicle? In the recent case of People v. Fews, a court of appeal determined it can. In February 2017, Officers Dominic Vannucchi and John Vidulich were patrolling the Tenderloin District of San Francisco, an area known for narcotics sales, use and related violence. They saw an SUV in front of their marked patrol car speed up and then abruptly halt in a red zone, as though attempting to avoid a traffic stop. The SUV’s registration was expired, so the officers stopped behind it and activated their lights. The driver quickly got out of the SUV and wouldn’t get back in when officers repeatedly asked him to do so. Instead, he stood facing the open driver’s-side door and reached back into the vehicle. Meanwhile, the passenger was “making furtive movements around the passenger compartment low on his body.” The SUV’s tinted windows prevented the officers from seeing what he was doing. As the officers approached, they smelled recently burned marijuana, and the driver admitted he had been smoking a blunt. The passenger continued his furtive movements, and the officers believed he might be reaching for a weapon. They ordered him to exit the vehicle and performed a pat-down search, thinking his baggy clothing could be concealing a weapon. They wanted to ensure they could safely search the SUV to determine what the driver and passenger had been rummaging around for. They found a loaded semiautomatic gun in the passenger’s pocket and arrested him. They then searched the SUV, but found no other evidence. Charged with a number of offenses related to the illegal possession of the firearm, the defendant moved to suppress the evidence of the handgun on the grounds that officers didn’t have sufficient reason to believe he was armed or dangerous. The court denied this motion, finding that the presence of marijuana, the high-crime area and the nervous behavior of the suspects “were reasonably suggestive of unlawful drug possession and transport” and the pat-down search was justified for officer safety. 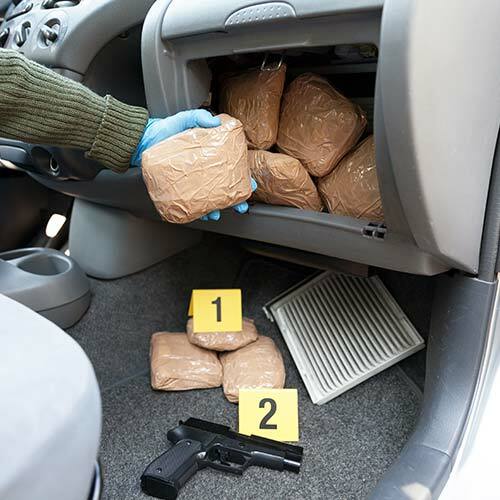 Previous cases have already established that police officers have probable cause to search a vehicle based on the odor of marijuana to determine whether a person is adhering to statutory possession limits, despite a medical marijuana prescription (People v. Strasburg, 2007), and that officers who see a small amount of marijuana in a vehicle may reasonably suspect additional quantities might be found there (People v. Waxler, 2014). In People v. Fews, the court ruled that those guidelines continue to apply after Prop 64. “The continuing regulation of marijuana leads us to believe that Strasburg and Waxler still permit officers to conduct a reasonable search to determine whether the subject of the investigation is adhering to the various statutory limitations on possession and use, and whether the vehicle contains contraband or evidence of a crime,” it concluded in September 2018. This is an important clarification for law enforcement as we strive to protect both public and officer safety while navigating the evolving legal landscape of post–Prop 64 California. LAAPOA will continue to monitor these issues and update our members on the developments that affect them.